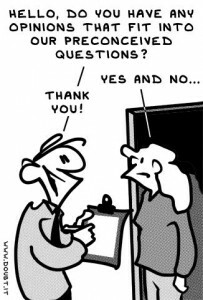 NOAA Climate Survey – A Biased Approach To Assess NOAA Employees’s View Of Climate Science | Climate Science: Roger Pielke Sr.
UPDATE Feb ruary 6 2012: I was informed by Hilary Ostrov of The View From Here that my answers in the tables using yes and no could be misleading. Thus I have changed to an X.
I have reproduced it below with my comments inserted. This voluntary survey should take about 10 minutes to complete. It is designed to gauge the current level of climate knowledge among NOAA personnel and partners who respond to the survey. Your answers will be completely anonymous. For questions that you don’t know the answer, please choose the “Don’t Know” option rather than guessing. If you choose “Other” to answer any question, you can enter text directly in the small box, or paste a response of up to 300 characters into the field. With which NOAA office are you associated? To improve our ability to draw valid conclusions from the survey without identifying individuals, please enter a unique five digit number that you will remember and use again on related surveys (for instance, you might choose the last five numbers of your personal phone number). My Comment: I doubt most responders really conclude they are anonymous. 1. Which of the following statements about global climate change is true? My Comment: This is a very poorly worded question (perhaps deliberately so). The question implicitly equates global warming (i.e. “increased global temperature, decreased presence of ice” with the term “climate change”. Most all climate scientists accept that humans are altering the climate system, but it is much more than the narrow focus on changes in the global average heat content of the climate system. By checking “Most climate scientists agree that global climate change is happening”, the users of this survey will claim an agreement with the IPCC viewpoint. A robust question would be with respect to which of the hypotheses below have not been refuted? Hypothesis 1: Human influence on climate variability and change is of minimal importance, and natural causes dominate climate variations and changes on all time scales. In coming decades, the human influence will continue to be minimal. 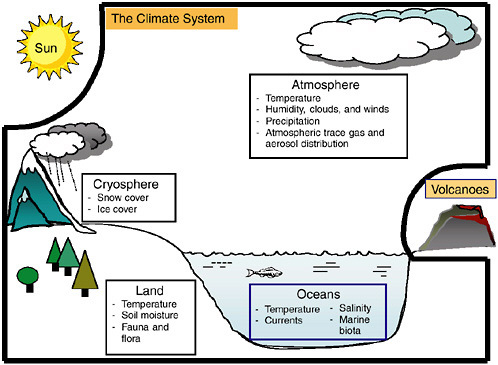 Hypothesis 2a: Although the natural causes of climate variations and changes are undoubtedly important, the human influences are significant and involve a diverse range of first-order climate forcings, including, but not limited to, the human input of carbon dioxide (CO2). Most, if not all, of these human influences on regional and global climate will continue to be of concern during the coming decades. Hypothesis 2b: Although the natural causes of climate variations and changes are undoubtedly important, the human influences are significant and are dominated by the emissions into the atmosphere of greenhouse gases, the most important of which is CO2. The adverse impact of these gases on regional and global climate constitutes the primary climate issue for the coming decades. 3. Which of the following best describes the relationship between climate and weather? My Comment: Whoever prepared this survey is not knowledgeable in climate science. Climate is a system of physical, biological and chemical processes involving land, the ocean, the atmosphere and continental ice sheets. The figure below accurately illustrates this system (which is not one of the possible answers above unless you click “other”. My Comment: This is a ridiculous question! The Earth’s history spans billions of years. My Comment: The questions again focus on a global average temperatures. My Comment: This illustrates that the focus of the survey is on carbon dioxide. It also is a simple question that would be one of many a student might have in high school multiple choice test! My Comment: Another high school science question that can be answered just by looking at a data set such as from Mauna Loa and elsewhere (e.g. see). My Comment: Yet more focus on CO2. 11. Which of the following are among the expected impacts of global climate change? My Comment: This question is to lead the NOAA employee from the CO2 levels directly into impacts. A more biased survey would be hard to write. A. As a result of global climate change, the warmest places on Earth are likely to see the greatest increases in temperature. Here the question inaccurately equates global warming with climate change! They are not the same. B. Over the last decade, the U.S. has experienced about twice as many record-breaking hot days as record-breaking cold days. The surface temperature data is biased by siting quality. C. Most of the heat added to Earth’s climate system over the last five decades has been absorbed by the ocean. D. Federal agencies are currently working with communities to help them prepare for extreme weather and climate impacts. The federal agenices are not properly preparing communities if they rely on the limited scenarios provided by NOAA for climate in the coming decades. E. Corals in warm, tropical seas around the world are thriving as the ocean waters around them get warmer. Tropical seas are not warming in all coral regions. This is a nonsensical survey statement. My Comment: These are more questions intended to “educate” the person being surveyed rather than seek objective input from those being surveyed. My Comment: The person(s) who create this survey question apparently do not even know the ocean is alkaline. My Comment: The role of human climate forcings in altering atmospheric/ocean circulations such as ENSO is an important research question. The survey question, however, continues the narrow focus on “global climate change” which they use as a synonym for “global warming” due to added CO2. My Comment: For the readers of this weblog post who are NOAA employees, I hope you communicate the failure of this survey to add to our knowledge of climate science. The survey is actually a policy advocacy document, as well as an evaluation of the loyalty of NOAA employees to the perspective of individuals such as Tom Karl and Tom Peterson.